Published by the Eva Rosenstand Company. 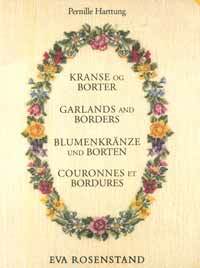 20 pages include small floral garland designs, borders and an alphabet. Colored pages illustrate finished embroideries. Published by the Eva Rosenstand Company. 20 pages include charted designs for summer flowers, an ivybranch, blackberry, strawberry, yellow and red roses, grasses and mini designs for place cards and three alphabets. 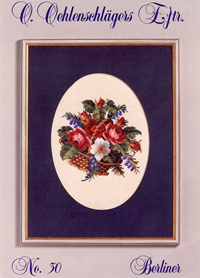 Colored pages illustrate finished embroideries. DMC floss requirements listed. 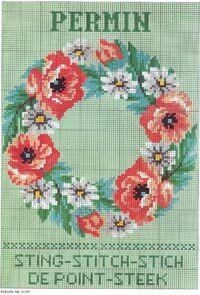 15 pages of Spring floral wreaths, borders and Easter designs. Designs are graphed in color. 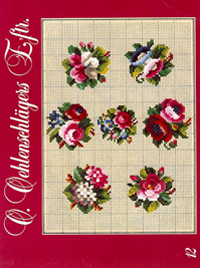 This book contains 17 Berliner type floral designs all graphed in full color. DMC floss colors used are stated on back page. No stitching instructions included, only charted design. 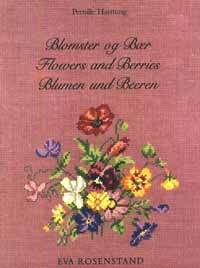 This book contains 35 large and small floral designs, many with roses and violets. Graphs are in color, however DMC floss colors are NOT stated. You must choose your own, according to the colored picture. No stitiching instructions are included.